Ultrasound has become the most widely used and important tool in the diagnosis and treatment of infertility and IVF. Measuring the antral follicle count (AFC) is one of the best predictors for estimating ovarian reserve. This initial ultrasound exam will immediately affect the management of the patient and help determine IVF stimulation protocols. The initial exam also picks up benign and malignant ovarian masses and the most common cysts are covered in the chapter. Doppler modalities of ultrasound allow identification of the direction and magnitude of blood flow and calculation of velocity and can help distinguish benign from malignant masses. Three-dimensional (3D) transvaginal ultrasound (TVS) techniques allow the identification and quantification of hypoechoic regions within a three-dimensional ultrasound (3D) data set and provide a precise estimation of their absolute dimensions, mean diameters, and volumes. Accurate evaluation of size and volume of complex structured follicles is facilitated. 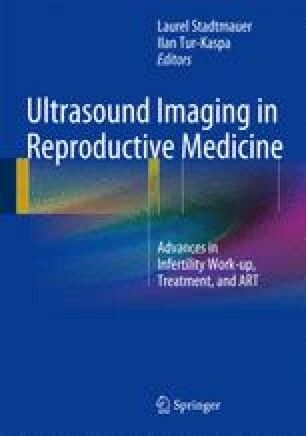 This chapter is aimed to review how ultrasound is used to maximize ART outcome by evaluation of the ovary and assessing ovarian reserve.